TOLEDO, OH--(Marketwired - Sep 5, 2013) - Beyond Gaming, which hosts grassroots online competitions on its platform for hundreds of thousands of gamers, has quickly learned that gamers are passionate and motivated by real world prizes, especially QSR (Quick Service Restaurant) digital gift vouchers. In fact, on their proprietary "Play For It!" platform, both casual and core gamers are engaging as much as ten times a day with these brands to compete against each other and instantly win these rewards. Beyond Gaming has just launched a series of new competitions with top game publisher, Ubisoft. Timed with the launch of Ubisoft's Rayman® Legends, the "Rayman Legends Showdown" opened September 4. Beyond Gaming is also hosting the ShootMania Elite North American Qualifier for ESWC (Electronic Sports World Championship) which opens on September 7. Blaine Graboyes, CEO of Beyond Gaming, said, "We're all about rewarding participation at Beyond Gaming. Cash prizes and rewards for only the top players do not inspire grassroots engagement and growth. However, knowing they can easily 'Play For It!' 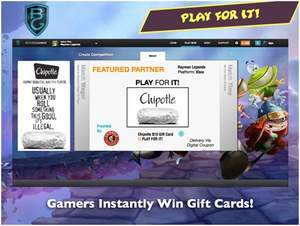 and instantly win a $10 Chipotle card, players are finding these QSR and other prizes to be a realistic and exciting incentive. Gamers are deeply engaging with brands and are validated in their passion for video games. It's a win-win for all involved." Beyond Gaming Advisor Justin Townsend, said, "Standard internet ad formats on the platform are definitely effective for all of our advertisers. However the chance for players to easily win prizes from the brands are driving consumer chatter, social media, and strong brand affiliation. Given that gamers and fast food go hand in hand, we initially carried out trials with QSRs which proved so successful that we are now including other ad categories, much to the delight of our gamer audience." Gamers can visit http://BeyondGaming.com/Rayman to join the Rayman Legends Showdown from September 4 to October 4 and compete for prizes from Gunnar Optiks, Astro Gaming, Chipotle, and more. Beyond Gaming is the social engagement and grassroots competition platform for the world's most popular video games. Players can challenge their friends and opponents in top PC, Xbox, and PS3 games using Beyond Gaming's virtual currency to compete and win valuable prizes. The company also runs top industry events with leading video game brands, software companies, advertisers, and celebrities. Beyond Gamings's "Play For It!" platform connects brands with gamers who compete for and instantly win their products. Casual gamers are interacting with brands as they are incentivized by real life prizes.